We haven't had chicken for a few days so it was time. The BBQ was almost out of fuel but I have two tanks so I only had to watch that it didn't go out. It lasted till the last 5 minutes cooking then died. I quickly switched tanks and relit. Then back inside to finish the peas. I did the rice in the microwave then the peas in there too. The beurre blanc was 2 tablespoons of my home made white wine made into vinegar then reduced by half in a small frying pan. Add butter and whisk it into an emulsion as it melts. Add a dash of salt and pour over the peas. I never knew frozen peas could taste so good. 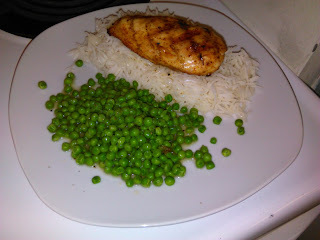 It doesn't look like an award winning plate but the chicken was moist and delicious, the rice had a hint of acid from the wine vinegar I dripped in and the peas in the beurre blanc were amazing. Really, frozen peas cooked in the microwave can taste amazing! Who knew!